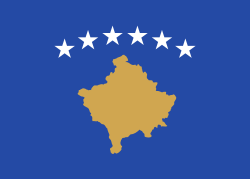 The national flag of Kosovo. The national anthem of Kosovo. The Republic of Kosovo (Albanian: Republika e Kosovës, Serbian:Република Косово) is a region in the south of Serbia. The area has been under United Nations administration since 1999 because of conflict stemming from the desire for independence. Kosovo's population is mostly ethnic-Albanian, a stark contrast to the rest of the population of Serbia. Kosovo was once an almost totally Serbian land. Under the long Ottoman rule, the land became more and more inhabited by Albanian migrants. The Turkish dominators favored the arrival of Albanians which ended up turning a Christian region into a Muslim-majority one. By the early 20th century, the Serbs were still in the majority, but because of demographic changes such as a high Albanian birth rate and Serb migration, they became the minority. Enver Hoxha, the Stalinist dictator of Albania from 1944 to his death in 1985, took advantage of this and created the precursor to the Kosovo Liberation Army (KLA) in 1979. Like Slovenia, Croatia, and Bosnia, the Albanians in Kosovo tried to break off from the former Yugoslavia in the 1990s. Serbian resistance to the KLA led to the Kosovo War, with both the United Nations and NATO intervening to stop violence. On 17 February 2008, the Prime Minister of Kosovo, former KLA commander Hashim Thaci, declared independence from Serbia. In January 2008, the former U.S. Ambassador to the U.N. John Bolton, former U.S. Secretary of State Lawrence Eagleburger and former Assistant Defense Secretary Peter Rodman warned in a joint statement that Western recognition of Kosovo independence would create "an avoidable confrontation with Russia" and "turn what is now a relatively small problem into a large one." Area: 10,887 square kilometers (4,203 square miles), slightly smaller than Connecticut. Population (2000 est. ): 2.1 million. Ethnic groups: 90% ethnic Albanians, 6% ethnic Serbs, 2% Bosniaks, Gorani, 1.5% Roma, Ashkali, Egyptians, 1% Turks. Religion: The majority ethnic Albanian population, as well as the Bosniak, Gorani, and Turkish communities, and some of the Roma/Ashkalia/Egyptian communities are adherents of Islam. The ethnic Serb population is largely Serb Orthodox. Approximately 3% of ethnic Albanians are Roman Catholic. Languages: Albanian (official), Serbian (official), Roma, Turkish (official only in municipality of Prizren), Bosniak, English. Education: Adult literacy rates (2004 est. ): 94.12% (men 97.30%, women 91.30%). Enrollment (2003 est.) --96% of children ages 7-15 enrolled in primary school. Health: Infant mortality rate--23.7/1000. Total fertility rate, births per woman (2000 est.)--2.7. Life expectancy (2003 est.) --75 years. Kosovo has been inhabited since the Neolithic Era. During the medieval period, Kosovo became home to many important Serb religious sites, including many architecturally significant Serbian Orthodox monasteries. It was the site of a 14th-century battle in which invading Ottoman Turks defeated an army led by a Serbian Prince named Lazar. The Ottomans ruled Kosovo for more than four centuries, until Serbia acquired the territory during the First Balkan War in 1912-13. First partitioned in 1913 between Serbia and Montenegro, Kosovo was then incorporated into the Kingdom of the Serbs, Croats, and Slovenes (later named Yugoslavia) after World War I. During World War II, parts of Kosovo were absorbed into Italian-occupied Albania. After the Italian capitulation, Nazi Germany assumed control over Kosovo until Tito's Yugoslav Partisans entered at the end of the war. After World War II, Kosovo became an autonomous province of Serbia in the Socialist Federal Republic of Yugoslavia (S.F.R.Y.). The 1974 Yugoslav Constitution gave Kosovo (along with Vojvodina) the status of a Socialist Autonomous Province within Serbia. As such, it possessed nearly equal rights as the six constituent Socialist Republics of the S.F.R.Y. In 1981, riots broke out and were violently suppressed after Kosovo Albanians demonstrated to demand that Kosovo be granted full Republic status. In the late 1980s, Slobodan Milosevic propelled himself to power in Belgrade by exploiting the fears of the Serbian minority in Kosovo. In 1989, he eliminated Kosovo's autonomy and imposed direct rule from Belgrade. Belgrade ordered the firing of most ethnic Albanian state employees, whose jobs were then assumed by Serbs. In response, Kosovo Albanian leaders began a peaceful resistance movement in the early 1990s, led by Ibrahim Rugova. They established a parallel government funded mainly by the Albanian diaspora. When this movement failed to yield results, an armed resistance emerged in 1997 in the form of the Kosovo Liberation Army (KLA). The KLA's main goal was to secure the independence of Kosovo. In late 1998, Milosevic unleashed a brutal police and military campaign against the KLA, which included widespread atrocities against civilians. As Milosevic's ethnic cleansing campaign progressed, over 800,000 ethnic Albanians were forced from their homes in Kosovo. Intense international mediation efforts led to the Rambouillet Accords, which called for Kosovo autonomy and the insertion of NATO troops to preserve the peace. Milosevic's failure to agree to the Rambouillet Accords triggered a NATO military campaign to halt the violence in Kosovo. This campaign consisted primarily of aerial bombing of the Federal Republic of Yugoslavia (F.R.Y. ), including Belgrade, and continued from March through June 1999. After 78 days of bombing, Milosevic capitulated. Shortly thereafter, the UN Security Council adopted Resolution 1244 (1999), which suspended Belgrade's governance over Kosovo, and under which Kosovo was placed under the administration of the United Nations Interim Administration Mission in Kosovo (UNMIK), and which authorized a NATO peacekeeping force. Resolution 1244 also envisioned a political process designed to determine Kosovo's future status. As ethnic Albanians returned to their homes, elements of the KLA conducted reprisal killings and abductions of ethnic Serbs and Roma in Kosovo. Thousands of ethnic Serbs, Roma, and other minorities fled from their homes during the latter half of 1999, and many remain displaced. Under UNMIK's guidance, Kosovo established new institutions (both at the municipal and central levels), held free elections, and established a multi-ethnic Kosovo Police Service (KPS). The KLA was demobilized, with many of its members incorporated into the Kosovo Protection Corps (KPC), a civilian emergency services organization. UNMIK gradually turned over more governing competences to local authorities. In March 2004, Kosovo experienced its worst inter-ethnic violence since the Kosovo war. The unrest in 2004 was sparked by a series of minor events that soon cascaded into large-scale riots. Kosovo Serb communities and Serbian Orthodox churches were targeted in the violence. After many years of international administration, Kosovo Albanian authorities continued to press the international community to begin a process to define Kosovo's future status. In October 2004, Kosovo held elections for the second 3-year term of the Kosovo Assembly. For the first time, Kosovo's own Central Election Commission administered these elections, under Organization for Security and Cooperation in Europe (OSCE) guidance. The main ethnic Albanian political parties were the same as in the 2001 elections, but with the addition of the new party ORA, led by Veton Surroi, and two new Kosovo Serb parties: the Serbian List for Kosovo and Metohija (SLKM) led by Oliver Ivanovic, and the Citizens Initiative of Serbia led by Slavisa Petkovic.. In contrast to the previous Kosovo Government, this election produced a "narrow" coalition of two parties, the LDK and AAK. The December 3, 2004 inaugural session of the Kosovo Assembly re-elected Ibrahim Rugova as President and Ramush Haradinaj as Prime Minister. In March 2005, Haradinaj resigned as Prime Minister after he was indicted for war crimes by the International Criminal Tribunal for the former Yugoslavia (ICTY); Haradinaj voluntarily surrendered to authorities and traveled to The Hague to face charges. (Haradinaj was acquitted of all charges on April 3, 2008.) The Kosovo Assembly subsequently elected Bajram Kosumi (AAK) as Prime Minister; Kosumi's resignation in March 2006 led to his replacement with Agim Ceku. After President Rugova's death in January 2006, he was replaced by Fatmir Sejdiu. In 2005, a UN envoy, Norwegian diplomat Kai Eide, was appointed to review progress in Kosovo. Eide reported uneven progress on many key issues, especially with respect to promoting multi-ethnicity in Kosovo, but said that there was no advantage to be gained by further delaying a future status process. In November 2005, the Contact Group (France, Germany, Italy, Russia, the United Kingdom, and the United States) produced a set of "Guiding Principles" for the resolution of Kosovo's future status. Some key principles included: no return to the situation prior to 1999, no changes in Kosovo's borders, and no partition or union of Kosovo with a neighboring state. The Contact Group later said that Kosovo's future status had to be acceptable to the people of Kosovo. In November 2005, United Nations Secretary General Kofi Annan appointed Martti Ahtisaari, former president of Finland, to lead a future status process. Special Envoy Ahtisaari's diplomatic efforts addressed a broad range of issues important to Kosovo's future, including decentralization of local government, protecting Kosovo's cultural and religious heritage in Kosovo, economic issues, and safeguarding the rights of minorities. Over the course of 2006 and early 2007, Ahtisaari brought together officials from Belgrade and Pristina to discuss these practical issues and the question of status itself. Ahtisaari subsequently developed a comprehensive proposal for Kosovo's future status, which set forth a series of recommendations on Kosovo's democratic governance and substantial protections for minorities. Ahtisaari also recommended that Kosovo become independent, subject to a period of international supervision. He proposed that a new International Civilian Office (ICO) be established to supervise Kosovo's implementation of its obligations under the Ahtisaari Plan. A European Union (EU)-led rule of law mission (subsequently named EULEX) would also be deployed to focus on the police and justice sector, while a NATO-led stabilization force would continue to provide for a safe and secure environment. Pristina accepted the Ahtisaari recommendations, but Belgrade rejected them. On April 3, 2007, Ahtisaari presented his plan to the UN Security Council. Due to Russian opposition, the Security Council could not reach agreement on a new Security Council resolution that would pave the way for the implementation of the Ahtisaari recommendations. After several months of inconclusive discussions in the Security Council, the Contact Group agreed to support a new period of intensive engagement to try to find an agreement between Belgrade and Pristina on Kosovo's status. A "Troika" of representatives from the European Union, the Russian Federation, and the United States, began this effort in August 2007. UN Secretary General Ban Ki-moon asked them to report on their efforts no later than December 10, 2007. The German ambassador to the United Kingdom, Wolfgang Ischinger, represented the EU; Alexander Botsan-Kharchenko represented the Russian Federation; and Ambassador Frank Wisner represented the United States. After an intense series of Troika-led negotiations, including a high-level conference in Baden, Austria, the Troika's mandate ended in December without an agreement between the parties. In its final report, the Troika explained that it explored with the parties every realistic option for an agreement, but it was not possible to find a mutually acceptable outcome. Kosovo declared its independence from Serbia on February 17, 2008. In its declaration of independence, Kosovo committed to fulfilling its obligations under the Ahtisaari Plan, to embrace multi-ethnicity as a fundamental principle of good governance, and to welcome a period of international supervision. The United States formally recognized Kosovo as a sovereign and independent state on February 18. To date, Kosovo has been recognized by a robust majority of European states, the United States, Japan, and Canada, and by other states from the Americas, Africa, and Asia. Shortly after independence, a number of states established an International Steering Group (ISG) for Kosovo that appointed Dutch diplomat Pieter Feith as Kosovo's first International Civilian Representative (ICR). As part of its commitment to the Ahtisaari Plan, the Kosovo Government rapidly enacted after independence laws on minority protection, decentralization, special protection zones for Serb cultural and religious sites, local self-government, and municipal boundaries. The Kosovo Assembly approved a constitution in April, and it entered into force on June 15, 2008. ICR Feith certified that the constitution was in accordance with the Ahtisaari Plan. At the time of certification, ICR Feith also congratulated Kosovo on a modern constitution that "provides comprehensive rights for members of communities as well as effective guarantees for the protection of the national, linguistic and religious identity of all communities." ↑ "Warning light on Kosovo". The Washington Times. 2008-01-31. http://www.washingtontimes.com/news/2008/jan/31/warning-light-on-kosovo/. Retrieved 2008-08-29. This page uses content from Conservapedia. The original article was at Kosovo. The list of authors can be seen in the page history. Conservapedia grants a non-exclusive license for you to use any of its content (other than images) on this site, with or without attribution. Read more about Conservapedia copyrights.